This is the very first post of my 1 Year 100 Vegan Recipes 100 Ingredients challenge! I’m super excited to begin, and I hope you are too. If you missed what this is all about, basically, my goal is to prove that vegan food is anything but limiting. So over the next year, starting today, I am going to post 100 vegan recipes featuring 100 vegan ingredients! For short 1/100/100. The first ingredient I chose: dun dun DAH! Asparagus!! Why? Well, because it’s in season here in Toronto. Like really, my parents are sick to death of it because so much grows in their garden. It’s a lovely green veggie that makes a good side dish when sautéed, easy to toss in a pasta, stir fry or on top of a salad. These are all fine and dandy, but I didn’t want to do the expected or ordinary. My hope is that my parents will get excited and go harvest more asparagus. And how do you get EVERYONE excited to eat their veggies? Turn them into fries! Who doesn’t like fries? Crispy, hot, you get to eat them with your fingers even in fancy restaurants, and they ready to be dunked, salted, or guzzled up as is. My recipe for Carrot Fries was a big hit, but unlike carrots and potatoes, asparagus isn’t starchy, so it isn’t going to get a nice crust on it’s own. I think a crusty outside is mandatory for fries, (soggy fries, ew) so I dipped them in panko bread crumbs. And the result? 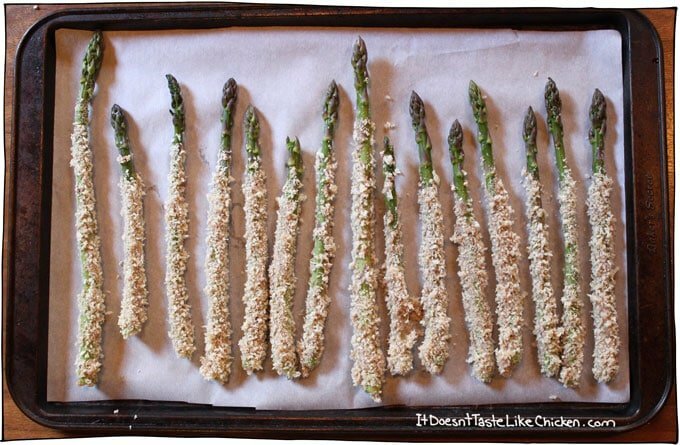 Crispy, delicious, flaky, even if you don’t love asparagus you will probably like these. 1 Recipe of Creamy Cashew Caesar Salad Dressing for dipping, spicy ketchup, or whatever dip you like. Get your fry making station ready. No don’t put on a hair net and get out a giant pot of boiling oil (ew! ), just set up three bowls: one with the almond flour (or whatever flour you prefer), the second with flax and warm water mixed together, and the last with panko bread crumbs. 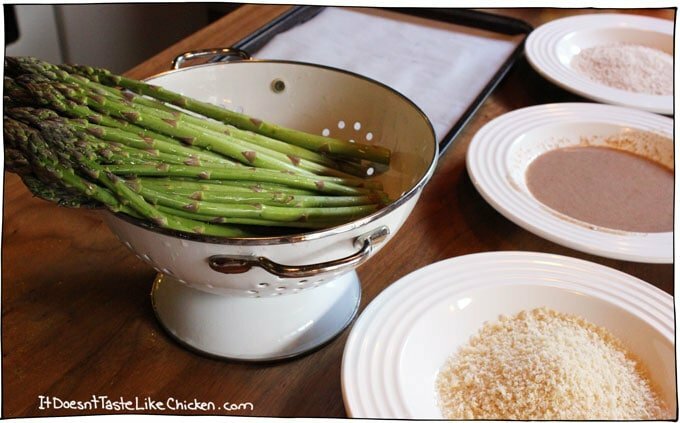 Wash your asparagus, and line a baking sheet with parchment paper. There, isn’t that a pretty fry station? Rinse the asparagus. While it’s still a bit wet, dip and roll around in the flour, then do the same in the flax mixture, then last in the panko. Place on the baking tray, and repeat with all the asparaguses…asparagusi? Until your baking tray is full. I like to leave the asparagus heads bald as it looks cute and they also get all crispy and delicious. When your tray is full, just pop them in the oven for 15 minutes. 364 days and 99 recipes to go! Hmmm I need some kind of countdown widget, anyone know of one? Previous Post: « Happy Birthday It Doesn’t Taste Like Chicken & a New Mission! I plan on trying these in my air fryer tonight. I think they will be perfect! 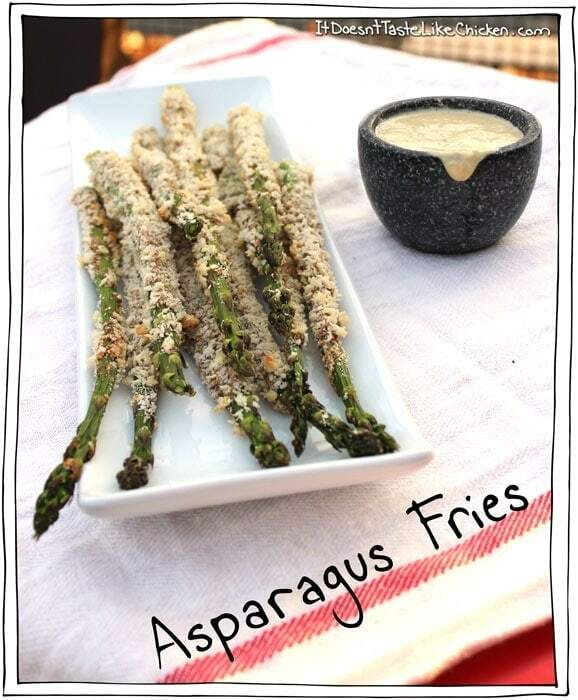 Made these last night (not asparagus season, but I couldn’t resist when I saw the recipe in your archives). They are FANTASTIC!! 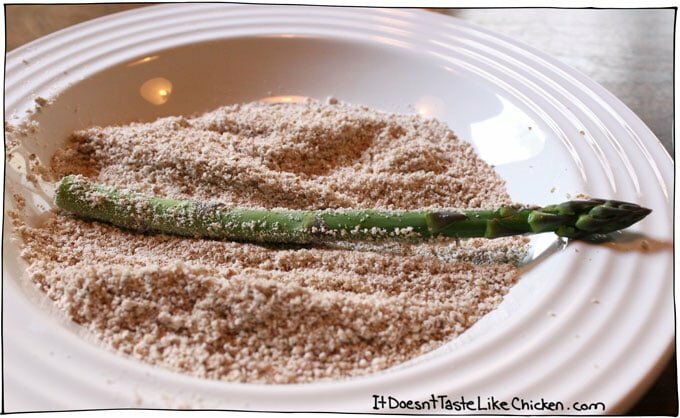 What a great and different way to have asparagus. Made your Creamy Cashew Caesar Salad Dressing to go with them; that was a great compliment. Thanks Sam. Aww thanks Srivani! I feel like you are my ultimate recipe tester!! Haha! Just keep me in mind when you plan your cookbook! crunchy and delicious! The flax seed adds such a nice nutty flavor! Thanks for this recipe! That’s great, so happy you enjoyed Melissa!! what temperature are they cooked at? What a fantastic mission! You have my support – these fries look delicious! Thanks Kathy!! 🙂 I’m going to be making a lot of recipes but I’m really excited about it! 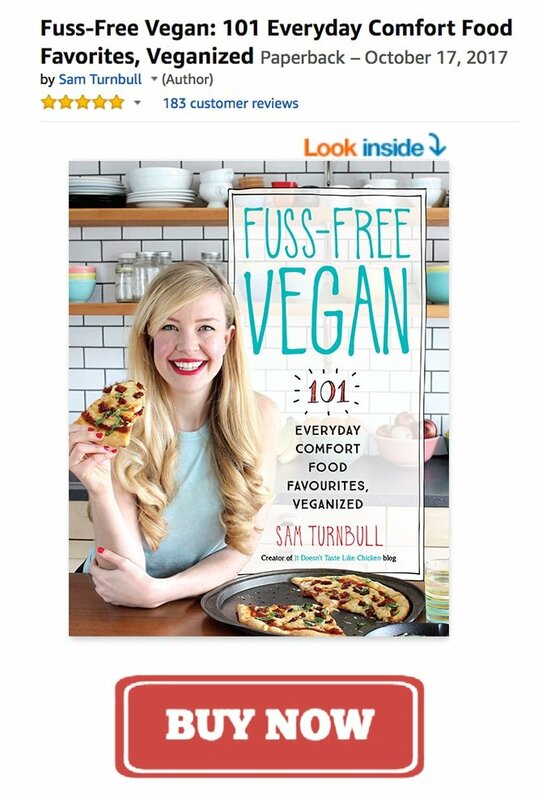 Hopefully this will show people that eating vegan is full of exciting flavours and options!